In the face of five interest rate increases during the past year and a half, the Office of the Superintendent of Bankruptcy Canada released a report showing the number of consumer insolvencies in November 2018 rose by 5.2 percent from a year ago, accounting for 97.2 percent of total insolvency filings, while business insolvencies increased by 8.9 percent. Business insolvencies decreased by 0.6 percent compared with the 12-month period a year prior, with the mining, oil, and gas extraction and manufacturing sectors falling the most, while construction and retail insolvencies sustained the greatest increases. Last year, the federal government’s fall economic statement projected two percent growth for 2019, which many predict will be lower due to low oil prices. The number of insolvencies rose in all provinces except Nova Scotia in November compared with the same period a year earlier. Newfoundland and Labrador's filings rose 11 percent, followed by Alberta at 8.3 percent. Quebec and Ontario grew by less than 1 percent. The combination of high household debt, rising interest rates, and slowing wage growth has been "terrible" for about half a year since early in 2018, said Director of Economics for the Conference Board of Canada Matt Stewart. He said higher interest rates have delivered a hit to household spending, which has been the primary driver of Canada's good economic fortunes. "It's been a long time since we've had a recession. As of yet, I think most of the news is still positive, but there is a growing amount of risks," he added. Therefore, business investment is seen as the next critical source of growth, however Mr. Stewart said the transition has yet to materialize because investment has underperformed, likely due to competitiveness concerns; businesses aren't sure whether Canada's the best place to put their money. Malaysia will seek jail terms and billions of dollars in fines from Goldman Sachs and four other individuals who allegedly diverted about USD $2.7 billion from 1Malaysia Development Bhd (1MDB), the country’s Attorney General Tommy Thomas said in a statement. The 1MDB scandal was a major reason for former Premier Najib Razak’s election defeat in May 2018, who has been charged with corruption over the scandal and pleaded not guilty. This is the first time Goldman Sachs, which has consistently denied wrongdoing, has faced criminal charges in the 1MDB scandal. Goldman Sachs has been under scrutiny for its role in helping raise $6.5 billion through three bond offerings for 1MDB, which is the subject of investigations in at least six countries. The United States (U.S.) Department of Justice has said about $4.5 billion was misappropriated from 1MDB, including some money that Goldman Sachs helped raise, by high-level officials of the fund and their associates from 2009 through 2014. A Goldman Sachs spokesman said the charges were “misdirected” and the bank would vigorously defend them and continue to cooperate with all authorities in their investigations. U.S. prosecutors filed criminal charges against the former Goldman Sachs bankers, Mr. Leissner and Mr. Ng, last month. Mr. Leissner pleaded guilty to conspiracy to launder money and conspiracy to violate the Foreign Corrupt Practices Act. Mr. Ng is detained in Malaysia and facing extradition to the U.S. The European Union (E.U.) and Japan will launch the world’s largest free trade zone early next year after their economic partnership cleared a final hurdle on Wednesday. Approximately 70 percent of European Parliament lawmakers backed the agreement which will account for nearly a third of global gross domestic product (GDP). Japan’s parliament approved the deal on Saturday. The trade deal follows widespread anti-globalization protests. Critics say the agreement will give too much power to multinationals and could undermine environmental and labour standards. The agreement will remove E.U. tariffs of 10 percent on Japanese cars and 3 percent for most car parts. It will scrap Japanese duties of some 30 percent on E.U. cheese and 15 percent on wines, as well as open access to public tenders in Japan. It will also open up services markets, such as financial services, telecoms, e-commerce, and transport. Japan had been part of the multi-lateral Trans-Pacific Partnership (TPP), comprised of twelve nations, which American President Donald Trump stated he would not participate in when he took office as it did not offer advantageous terms to the United States (U.S.). Without the economic capital of the U.S., there was little advantage to the TPP trade pact, therefore Japan and the other nations involved sought new bi-lateral trade deals with potential partners. A similar scenario played out between the U.S. and the E.U. when negotiations stalled in 2016 regarding the Transatlantic Trade and Investment Partnership (TTIP). Both the E.U. and Japan want the new trade deal in place before Britain leaves the E.U. at the end of March 2019. Japan, whose many car makers serve the E.U. market from British bases, had wanted it to then apply to a Brexit transition period until the end of 2020, although that period is uncertain due to political turmoil in Britain. A 552-carat yellow diamond was found at the Diavik mine in the Northwest Territories, Canada and is nearly three times the size of the next largest stone ever found in Canada. Diavik and the neighbouring Ekati mine are known to produce some very high-quality diamonds, though not normally the size of those found in southern African mines. The discovery is the seventh-biggest this century and among the thirty largest stones ever unearthed. The biggest was the 3,106-carat Cullinan, found near Pretoria in South Africa in 1905. It was cut into several polished gems, the two largest of which (the Great Star of Africa and the Lesser Star of Africa) are set in the Crown Jewels of Britain. Diamond mining in this area of Canada’s sub-arctic is incredibly difficult because there are no permanent roads, meaning the only access is by air or, for a few months a year, ice roads that have to be rebuilt each winter. The diamond market has also been under pressure, especially for smaller and lower quality stones and there’s currently an oversupply of such diamonds. A weaker Indian rupee has put pressure on manufacturers in the country, where 90 percent of gems are cut and polished. Major cutting centres have also been squeezed by low margins and a drop in trade finance. Hong Kong and Singapore have again been ranked as the most economically free jurisdictions in the world, with the United States (U.S.) back in the top ten, according to the Fraser Institute’s annual Economic Freedom of the World report for 2018. The Fraser Institute produces the annual Economic Freedom of the World report in cooperation with the Economic Freedom Network, a group of independent research and educational institutes in nearly one hundred countries and territories. It’s the world’s premier measurement of economic freedom. “While Hong Kong is still the most economically free, there is a valid concern that interference from mainland China—which ranks 108th in economic freedom—will ultimately lead to deterioration in Hong Kong’s top position, particularly in rule of law, which helps ensure equal freedom for all,” said Fred McMahon, Dr. Michael A. Walker Research Chair in Economic Freedom with the Fraser Institute. Rounding out the top ten are New Zealand, Switzerland, Ireland, the United States, Georgia, Mauritius, the United Kingdom, and Australia and Canada tied at tenth place. The United States is ranked at sixth, entering the top ten most-economically free countries for the first time since 2009. The report measures the economic freedom—the ability of individuals to make their own economic decisions—by analyzing the policies and institutions of 162 countries and territories. These include regulation, freedom to trade internationally, size of government, sound legal system and property rights, and government spending and taxation. The 2018 report is based on data from 2016, the last year of available comparable statistics. “Where people are free to pursue their own opportunities and make their own choices, they lead more prosperous, happier and healthier lives,” Mr. McMahon said. Today, an estimated 24.9 million people around the world are victims of forced labour, generating USD $150 billion in illegal profits in the private economy. In the wake of forced labour abuse revelations in global supply chains, companies are increasingly expected by consumers, investors, media, and governments to maintain transparent and responsible supply chains. Although more fashion companies are implementing changes to support vulnerable workers, a new report argues that there is still significant room for improvement. In KnowTheChain’s 2018 Apparel and Footwear Benchmark Findings Report, luxury companies Hermès, LVMH (Louis Vuitton), Salvatore Ferragamo, and Prada were among the firms the scored the lowest for fighting forced labor. Fashion companies are operating increasingly widespread and complex supply chains, which has made overseeing the rights of the labour force more complicated, opening the door for more risk of exploitation. Out of a possible score of one hundred, the forty-three brands benchmarked by KnowTheChain received a fifty-six. This was up from the previous report from 2016, in which the average was forty-nine. Ralph Lauren, Hugo Boss, and Kering all improved their scores by more than ten points. Hugo Boss, Ralph Lauren, and Burberry all scored above fifty points. According to the United States (U.S.) Department of Labor, labour exploitation occurs in everything from raw material harvesting for cotton and rubber to production of apparel and footwear. About two-thirds of the international fashion workforce is female, and much of the industry is also made of migrant workers. This adds to the risks surrounding labour violations, as workers face gender or socioeconomic discrimination, making them more vulnerable to mistreatment and less apt to know about their rights or take action. Country of origin is a key positioning tactic for luxury products, but growing globalization in the fashion industry is making it more difficult to differentiate the geographic source of goods. Fashionbi's "Mystery of 'Made-in' in Fashion" report notes that rather than accepting what is told to them by brands, consumers today conduct their own research into brands’ production processes. Consumers are also becoming more aware of the social and environmental impact of their clothing. Senior executives on Wall Street are icing out younger female colleagues to protect themselves against potential false, career-ending sexual harassment claims. Bloomberg interviewed nearly three dozen senior executives who work for hedge funds, law firms, banks, private equity firms, and investment-management firms about how their interactions with younger female staff have changed a year after the #MeToo movement brought to light workplace sexual harassment in Hollywood, media, and other industries. According to a new Bloomberg report, men on Wall Street have adopted defensive strategies intended to head off potential career-ending allegations including: avoid one-on-one meetings with female employees or meetings in rooms without windows; no more dinners with female colleagues; avoid work travel with female colleagues; avoid sitting beside female colleagues on flights; book hotel rooms on different floors; keep distance from female workers in elevators; and eliminate social functions like after parties. Even hiring women now carries fear and risk. The Wall Street report is only one example of widespread sentiment across industries. The #MeToo backlash against women in the workplace has created an anxious work environment and reduced opportunities for young women in particular to move ahead in their careers by limiting professional development and networking opportunities. It doesn’t help the situation when individual Millennials fail to handle constructive feedback and criticism in a professional manner, which has been discussed at length over the years as poorly reflecting on the generation as a whole and paints all Millennial women as overly sensitive and fragile. E-commerce giant Amazon is investing in the fashion and luxury sectors and aims to dominate market share. Amazon already accounts for nearly half of all online purchases in the United States, and with their purchase of Wholefoods last year, Amazon ventured into physical stores and has now opened its first pop-up shop on Baker Street in London. Luxury brands have long held the advantage of crafting a high-end customer experience in-store, and in spite of the sustained growth of shoppers preferring to place their orders online, luxury brand numbers of in-store visits have actually increased forty percent over the past three years, according to PwC’s Global Consumer Insights Survey. Yet attracting these customers means luxury retailers have made significant investments into curating bigger and better experiences for customers to buy into, in addition to the actual products, by turning their shops into restaurants, spas, and galleries. Amazon has been paying attention, offering live music, free makeovers, a beauty panel, juice bars, and yoga classes during their week-long pop-up on Baker Street. A recent survey by Swedish bank Klarna surveyed two thousand shoppers, of whom 31 percent said they like to make purchases after they have left the store, where 61 percent said they find e-commerce to be tedious without allowing them to touch or see items. Amazon Go stores in the United States have no cashiers nor checkouts. Customers walk in, pick something off a shelf, and walk out because thousands of sensors monitor each item and automatically bill the customer’s Amazon account. Amazon plans to rollout more of these stores in the U.S. and into the U.K. In the pop-up shop, Amazon Fire Tablets were held by assistants who could scan, view, compare, and purchase every product online; items could only be bought in the pop-up shop through the app. Amazon has launched five of its own fashion labels within the past year, all of which were on display in its pop-up. Amazon owns a photo studio in Shoreditch, another trendy part of London, where stylists and photographers take over half a million images a year for its website. General Motors has announced its intention to close eight manufacturing facilities and cut 15 percent of its workforce next year as part of its global restructuring and an effort to free up USD $6 billion per year in cash by 2020. Five of the factories are located in North America, including Oshawa, Canada, Detroit and Warren in Michigan, Warren, Ohio, a site near Baltimore in Maryland, plus one in South Korea, and two additional undisclosed international locations. GM’s rationale follows rising costs, including from new tariffs on materials such as steel, and slower car sales as buyers in North America have turned away from smaller cars to bigger vehicles such as SUVs and trucks, which now make up nearly 70 percent of total car purchases in the United States (U.S.), and investment in electric and autonomous vehicles, which are expected to drive future industry growth. Ohio’s Democratic Senator Sherrod Brown called the decision "corporate greed at its worst" while the state’s Republican Senator Rob Portman said he was "deeply frustrated". U.S. President Trump said he thought pressure on GM would lead it to direct new work to the plants, at least in Ohio. Labour unions in Canada and the U.S. also said they would press the company to allocate more work to the factories, instead of closing them. During the 2009 global financial crisis, the Canadian federal government offered automakers a CAD $10.8 billion bailout in loans, share purchases, and subsidies. Some of that money was paid back, however the net loss is between CAD $4 billion to $5 billion, including a CAD $1 billion loan write-off. Canadian Prime Minister Justin Trudeau said he expressed his "deep disappointment" in the closure of the Oshawa GM plant, which is sixty-five years old and currently employs 2,522 works, compared to nearly 23,000 thirty-five years ago. 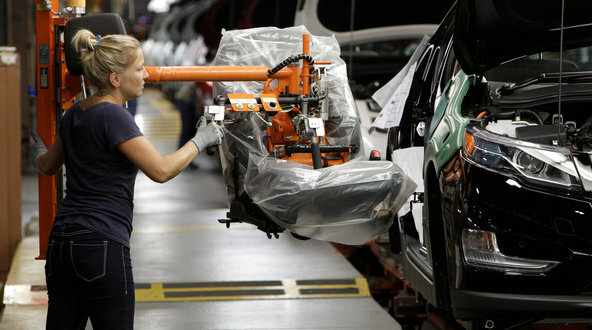 The plant accounts for 6 percent of total vehicle production in Canada, according to Scotiabank economist Juan Manuel Herrera, who publishes the bank's monthly Global Auto Report, and said production in Oshawa was set to decline next year by 40 percent from current levels because the vehicle models made there aren't big sellers.